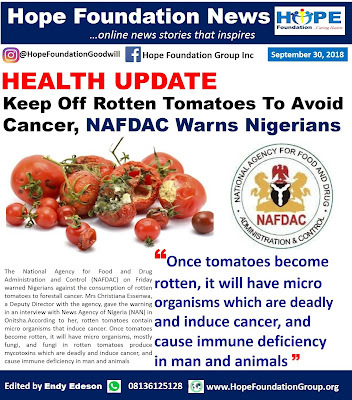 The National Agency for Food and Drug Administration and Control (NAFDAC) on Friday warned Nigerians against the consumption of rotten tomatoes to forestall cancer. Mrs Christiana Essenwa, a Deputy Director with the agency, gave the warning in an interview with News Agency of Nigeria (NAN) in Onitsha. According to her, rotten tomatoes contain micro organisms that induce cancer. "Once tomatoes become rotten, it will have micro organisms, mostly fungi, and fungi in rotten tomatoes produce mycotoxins which are deadly and induce cancer, and cause immune deficiency in man and animals" She said. She has started selling satchet or tin tomatoes why won't she discourage fresh tomatoes. Bem; Is it Mrs Christiana Essenwa, a Deputy Director of NAFDAC that has started selling satchet or tin tomatoes? Pls Yoruba women hear this oo.